In a post that I published in 2008, I wondered whether Italy could survive as an industrialized country with oil over $ 100 per barrel. Four years later, we have seen oil prices going through a cycle of collapse and return to high levels. Italy showed signs of recovery during the low price phase, in 2009, but the last two years with oil at over $ 100 per barrel seem to have hit hard the Italian economic system. 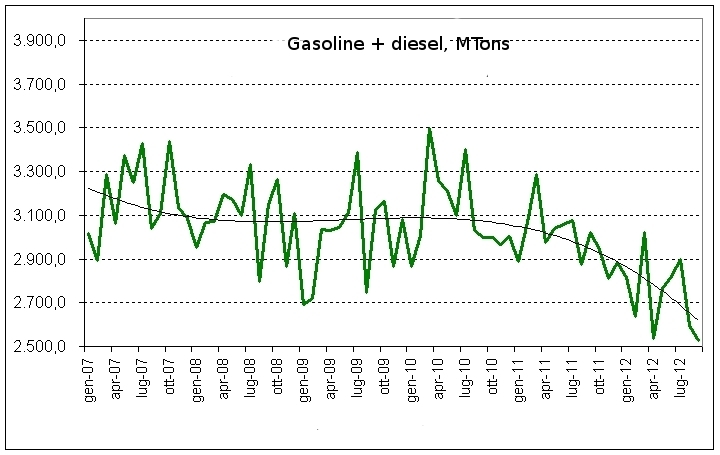 Automotive fuels have shown the following trends: gasoline has seen a reduction of 18.2% in consumption while diesel fuel has seen a 15.6% reduction, both with respect to September 2011. 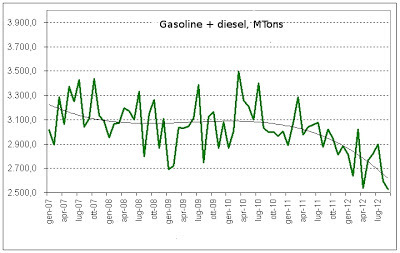 Summed together, the loss of the two fuels has been of -16.3% with respect to Sept 2011. In this month, the sales of new cars have shown a contraction of 25.5% with respect to Sep 2011. The first nine months of 2012 have seen a contraction of 20,4% in the sales of new cars. I don't know if you like to define that "decline" or, simply, "collapse". Surely, something bad is going on with Italy and the measures that the government is taking against financial collapse look more and more like the attempt of curing a cough by strangling the patient. Anyway, you can Google-translate De Carlo's post and give a look to more data (to read the figures, note that in Italian benzina stands for gasoline and gasolio for diesel fuel). Perhaps you also wonder how it feels being in Italy in this period: given the situation, you'd expect to see people going around in ox-driven carts. But I see nothing of that sort in the place where I live, Florence and vicinity. Traffic is normal everywhere, even with the usual traffic jams at rush hours. Perhaps, poorer areas of the country, e.g. in the South, have been hit much harder, but there don't seem to exist reports in the media on this matter. But there is a curious sensation around. You know, it is like one of those disaster movies; those where you know that the tsunami will arrive, or the dam will burst, or the volcano will erupt right under Los Angeles. Before the catastrophe, you see people worried about their everyday things; oblivious of the impending disaster. And yet, there are ominous signs all over that "something" is going to happen. In downtown Florence, plenty of shops seem to be either closed or in the verge of closing. You and others (TheOIlDrum, Energy Bulletin and Our Finite World blogs) are doing a lot to address the question of ' the where' we are headed and ' the what' is likely to happen. 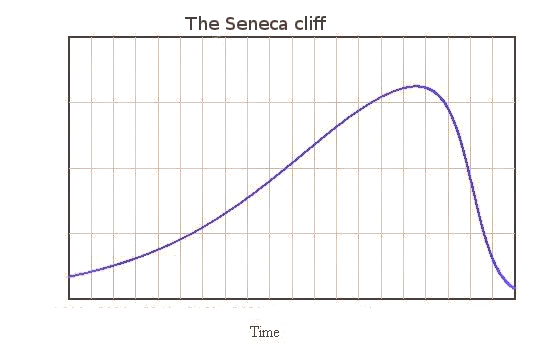 Using the analogy with chemical reactions, I'd say we are looking at the thermodynamics but not to much on the kinetics, and again, using the analogy, maybe some of the kinetics will be unfavourable. I realise addressing 'the when' is much more difficult, easier to get wrong and hence, easier to rubbish like the Limits To Growth. I've read your post with mixed sensation. Since I live both in Russia and Italy, I am concrned about oil prices in two different ways. The Russian budget strongly depends on high oil prices and our currency as well. But staying in Italy, I am worried about increasing gas and oil prices. So I am a victim of globalization. About car market. Italian government should permit expats to buy cars. The market would immediately go up! Impressive, I wouldn't have thought it to be so harsh. The good side is that you will soon get answers to questions you have been asking yourself for long ! Please tell us more as it unfolds, it might be useful for us in France : we're not that far on the list ! Is it all bad 'for the economy'? As long as Italians are using most of the savings on purchases that source more from within the Italian economy, the net result might be that fewer firms go bankrupt and, thereby, are able to stay in business and keep their employees? More money circulating in Italy itself than there would be otherwise in an economic downturn? Perhaps one could call a bicycle a sensible investment? But what is happening in the South? Where are your intrepid reporters? I think I have an answer to my own question. Cars and petrol are remarkable, but the whole economy is shrinking albeit not at the terifying 20% (yet). Consumer spending as a whole to go down by 3%. That is contraction for sure and bad news for such a large European economy. International Energy Agency, just said that in the next 5 years oil price (Brent)should decrease until 87$/barrel, because the economic crisis spreading to China and the increase in oil production in USA and Iraq. By the way I want to warn foreigner readers, that in Italy almost 60% of the gasoline price is taxes, and that the recent increases of gasoline/diesel prices are due by a further increase in taxation, more than by a direct influence on the oil price variation. "are due by a further increase in taxation"
Is this increase on the tax defined as percentage of sales price (VAT type), or on the fixed volume based tax part ? In any case would say the worst we could to these days is to decrease the taxes on fossile fuels, and especially the volume based part. In fact increasig the volume based part is probably the best adaptation policy, but this requires the asscoiated message, being able to maintain a good level of redistribution, and why not decresing the taxes on work in parallel. I see that this post of mine has generated a lot of interest in terms of comments. It can also be seen as a remarkable spike in the number of contacts for the site. After more than two years of EU bickering and dithering the ECB was finally allowed to do its own version of massive QE. That was the minimum necessary to stabilize the European debt and debt service "spread" situation. The next needed steps (if there is to be "more Europe" instead of much "less Europe") will be Banking Union and Fiscal Union. But so far there is no clear plan, roadmap or schedule for either of those things to happen and instead much continuing disagreement (some now being better masked or dissembled) between Mr. Schauble and most other relevant ministers of finance or political leaders. China has done some monetary loosening also lately - apparently fearing a slowdown more than inflation- but seems to be heading down a dangerous dead end with Japan over those rocks full of oil. The IMF just finished its annual meeting in Tokyo where Christine La Garde said she is a "desperate optimist" and that if everything goes well things should be better for the world economy by the end of 2013 although there are some "present dangers". But everyone can rejoice that in the meanwhile at least Goldman Sachs' "investment banking" arm has again posted huge record profits yesterday. This is the wider world economic and finance context in which countries like Italy will have to find their way toward economic renewal. In addition of course to having to deal with the massive corruption and malfeasance at every level of Italian government. (national, regional, provincial, and local) as is being finally a bit more vigorously reported and exposed recently by RAI TV Internazionale which is airing slightly fewer of the usual leggy women and variety shows -though still plenty- and the police reality TV sorts of serials glorifying the police, that were its hallmark under the great tutelage of Mr. Berlusconi. And then of course there is Syria right nearby, Iran waiting in the wings, and the continuing inward migration from the Maghreb across the "Mediterranean Lake" ....and a few other "minor issues" such as oil at over 100/ barrel which will.sooner rather than later certainly be heading higher. Hugo - I'm afraid you're mistaken about Italy being hit much harder by climate destabilization than other places. From the top end, have a look at Munich Re's records (since '72 ?) of the rise of extreme impacts worldwide. From the bottom end, talk to farmers in as many nations as you can reach. The damage you see is going on globally, in diverse forms. Aiguo Dai's charts for NCAR on the PDSI changes [Palmer Drought Severity Index] track the global changes in rainfall from 1950 to 2099, and should be posted in all colleges, legislatures, and preferably bus stops. Sadly they show that trends to date are accelerating, and that rainfall for basic societal needs, and agriculture, are looking grim for the whole Mediterranean basin, surprisingly soon. it is also a potentially catastrophic waste of our most scarce resource : namely time. The longer that awakening is delayed, the greater the geopolitical stress loading on efforts for assembling commensurate global climate action. here in the UK we're losing 32 chain-store shops per day around the country - how many are you losing ? An increase in taxation seems to help reducing oil use. Sven Giegold, Member of European parliament, shows the increased import costs of fossil fuels and current account of Italy and other EU Countries. So maybe this higher taxation helps to get a better current account. I have been on a 'break' from Peak Oil. Sometimes it is just too depressing. But coming back into it I am once again reminded of your insightful observations and analysis. As for the 'implosion' of Italy, as an ignorant outsider I would suggest, as one possibility for the normalcy you observe, is that people are resilient and will modify their lifestyles to suit. That can continue for some time but eventually a more fundamental rearrangement must be made. That will not be 'normal' by any means, or restricted just to Italy. Human beings seem to have a profound inability to handle problems that are a decade or more in the future, we expect it next year or perhaps the year after. So the effects of peak oil or global warming must happen now or within a couple of years. On the yearly timescale these perturbations are like noise, it is hard to see the longer term pattern. Only when we see a large system that has decadal response times, such the arctic ice sheet, or the global economy do we see the undeniable signal amplified. Thank you for your blog Ugo. 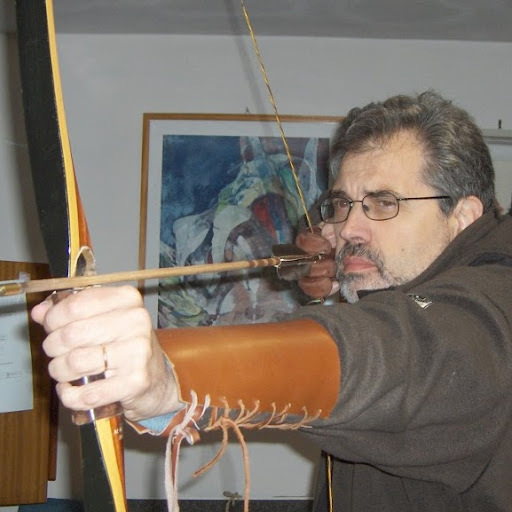 Is the Aquila Inquisition another symptom of Italy's fall ? Climate: the 9/11 moment has arrived?